Donald J Trump had shaken a hornet’s nest of hatred, anger and shock simply because he became President against ALL ODDS. The American leftist elites (political, media, academic and social) like their European counterparts, have never encountered such a focused, determined and actually Truthful and Patriotic personality before; someone who tells the world what his intentions are and does them using Twitter to change history. Before he became President, DJ Trump already told the Europeans, Chinese, Japanese, Russians and all others exactly what he intends to do to rectify ALL the One Sided agreements made by previous administrations which were and are detrimental to the well fare of the American people. He castigated the Europeans for never honouring to pay their fair share as they had agreed but instead let American tax payers to do so instead. For 70 years, the USA defended Europeans against the Soviet Union. Americans saved Europeans in WWI and WWII. American money rebuilt devastated Europe and turned it into powerful thriving democratic entities instead of subjugating them unlike what the Soviets did to Eastern Europe. It was American money and military sacrifices that stopped the expansion and then caused the collapse of Communism invariably while the European leaders insulted and undermined her. Macron, whose country of France surrendered to the Nazis within 40 days of fighting (while the Jews in the Warsaw Ghetto uprising fought the Nazis from sewers for over 40 days) and whose survival was made certain by US intervention in WWII is telling the Europeans that they need to create a European Army to defend the continent against Russia, China and even the USA. Macron has proven himself so far as a dedicated Globalist who approves of open borders and millions of immigrants. He, like Merkel and most of the other leftist/socialist clueless European leaders does not even realise how utterly stupid and irrational his statements and actions are. 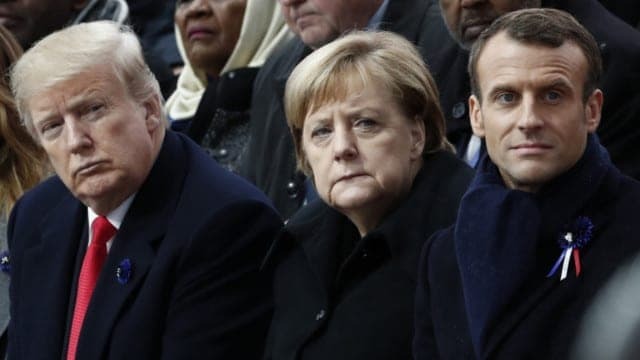 Macron, Merkel, Teresa May and others like them have been demonising, de humanising and suppressing anyone who reveals the FACTS about Muslims and Islam thus alienating these justifiably concerned peoples pushing them to turn to Patriotic parties who copy DJ Trump in his attempt to secure the borders as well as trying to stop all illegal INVASIONS of the USA. Your Democrats and your Fake Media have been doing the same for decades. Slowly but inexorably the tide in Europe is turning against most of the Globalist, Open Borders criminally negligent leaders. Millions of Europeans are literally scared for the future of their nations. The only Beacon of hope is Donald J Trump as the defender of Western Civilization against the hordes of illegal INVADERS whether Muslims or otherwise. Without the USA, Putin and others can take over slices of Europe without too much trouble because most European armies have been reduced more to police levels than for actual serious combat. Several generals in the armed forces of Europe have declared that the state of readiness of their military is just about 40%. DJ Trump will continue on his path to correct the injustices Europeans and others cause Americans financial, social and political. If they want to go alone, so please let them because it would be infinitely better to use American tax payers’ money for America than subsidizing ungrateful and spineless Europeans. Although tens of millions of Americans stupidly voted for Democrats who actually follow the same agenda of Globalism and Open Borders as the European elites, one hopes that millions of them will change their mind when they watch Europe suffering civil strife in the forthcoming stage of anarchy and serious social turmoil.